The PES was kind enough to e-mail me a copy of Poul Nyrup Rasmussen’s open letter to the European Liberals (whose campaign launched today) where Rasmussen calls into question the Liberals’ statement that “The single market should be reinforced and extended in energy, postal services, railways and health care”. The full letter is available at the LME-LSE website here. All very well – managing to guarantee high quality, affordable and accessible public services is exactly the sort of thing the PES should want. But there are two fundamental misconceptions here: firstly that public services are necessarily good at the moment, and secondly that market forces necessarily challenge the public service ethos. The letter is intentionally vague about private enterprise: liberalisation does not necessarily mean privatisation. So what about each of the four policy areas Rasmussen mentions? First of all healthcare. This is very controversial as each European country has different systems and different payment methods. So any possibility for patients to move for treatment is going to cause all sorts of tensions and tumult. But no European country has a US-style pay to be treated system and if some countries have an excess of specialists it only makes sense to be able to be treated elsewhere. So if everyone treads carefully this should be possible to sort out, and in principle it should be fine. Secondly railways. Liberalisation of railway services is something I happen to know a lot about; I wrote a Masters Thesis about it. There is a basic principle in railways that network investment is something that has to be looked after by the state, I don’t think that is open to challenge. Beyond that competition in services is a good thing – if there’s adequate capacity why not have a slow, cheap service and a fast, premium service on the same route? When it comes to services in rural areas you set the right public service agreements when tendering and it should not matter which firm runs the services. Lastly – and most significantly – state run enterprises can profit from liberalisation too. 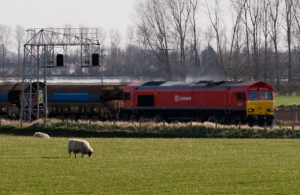 The railway engine pictured has a Deutsche Bahn livery and is running in the UK, and Deutsche Bahn is still state owned. Third, postal services. Once more Germany provides the example here – Deutsche Post has expanded internationally, gradually developing its business. At the same time state operators like Royal Mail and La Poste have withered, their national monopolies being knawed away at by private sector competitors. It’s inherently negative to want to defend a national operator, well, just because it’s a national operator and it employs a load of people. Postal volumes are declining across Europe as it is – maintaining things as they are presently is not an option. Lastly, energy. Here the case for a functioning European market is surely clearer than in any of the other 3 cases. No European country is energy independent, we all rely on each other for gas and electricity imports and exports. So how should these supplies be organised? We could go for the option of some Europe-wide price limits, a Europe-wide energy market regulator or something like that, or alternatively try to make sure that there’s a fair and competitive market at the wholesale level for gas and electricity. There’s no way to defend the status quo, so a proper functioning market is a must. In essence, the PES has the right idea – that services should be high-quality, affordable and accessible to all – but it seems there is a lack of coherent and optimistic thinking about how that should be done. It’s vital that every citizen – from Limerick to Luleå, Braga to Brasov – has access to affordable and excellent quality healthcare, the very best public transport, affordable and efficient postal services, and fairly priced gas and electricity. Yet Rasmussen’s letter does not know whether to look forward or back; it reminisces for times past and also tries to look forward. That’s not an easy line to defend in an election campaign. EP approves the Services Directive, but what have they approved?